Link works from another system, this is the recommend process for adding works . 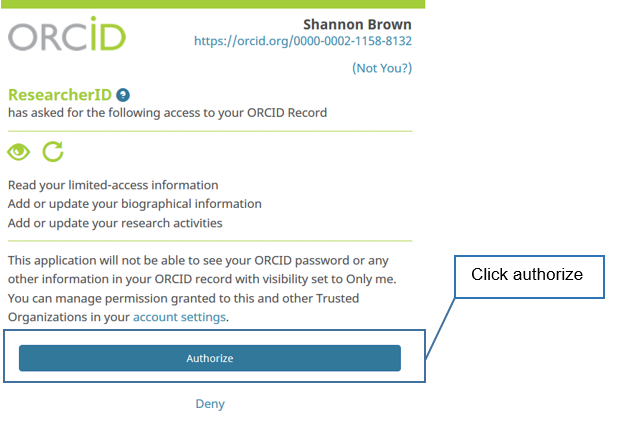 You are allowing trusted organizsations to access your ORCiD record. Examples of trusted organisations can be CrossRef, Scopus, DataCite, Web of Science. 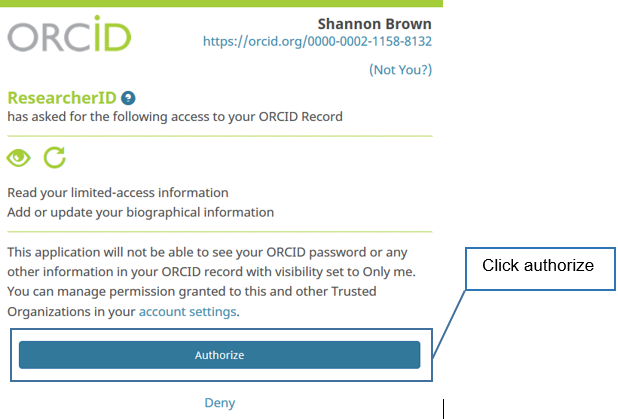 ORCID has created partnerships with our members to allow users to import publications into their ORCID record from outside databases. 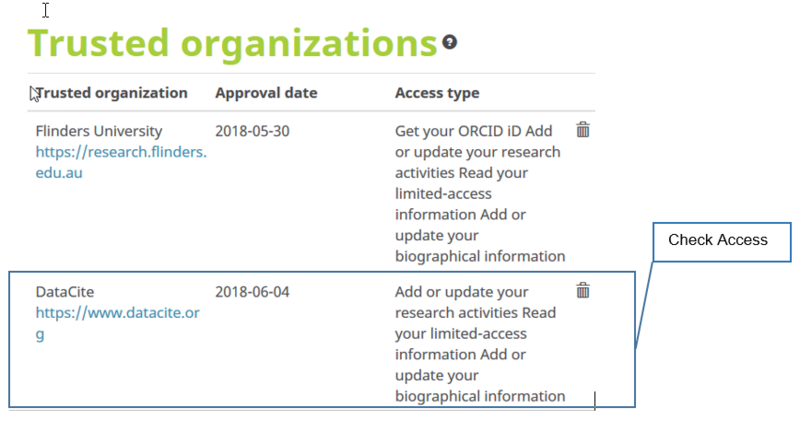 The linking process can begin either on the ORCID site with the Search and link tool under Add works, or at the member's website and will require you to grant access to the member organization before the works are added. 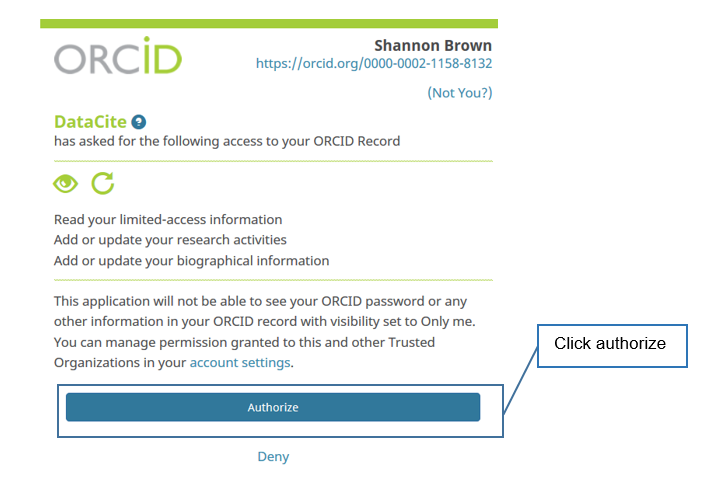 Once permission has been granted, you may revoke the access at any time by logging into your ORCID account, going to the Account Settings page, and clicking the trash can icon next to the item you wish to revoke. 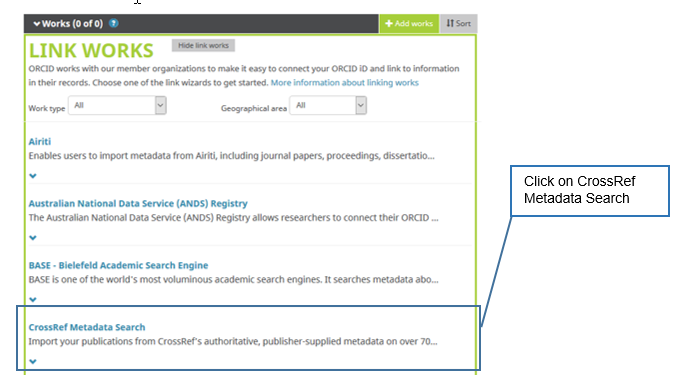 CrossRef will now push information to your ORCID record automatically. What does this mean? 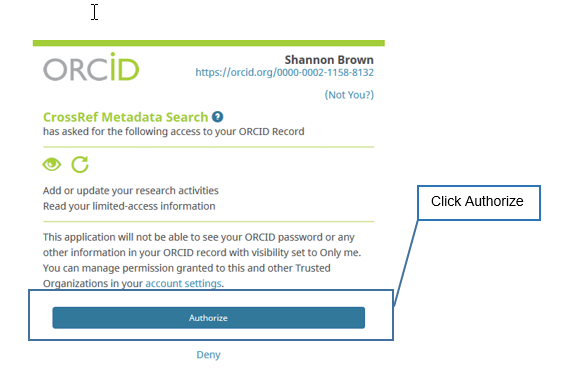 When your publication gets a DOI, your ORCID record will be updated automatically. 1. 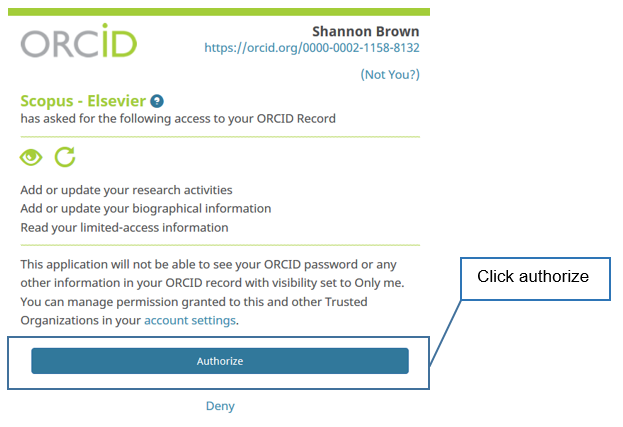 Log in to your ORCID record and navigate to Works, click on + Add works and select Search & link from the dropdown. Scroll down list and select CrossRef Metadata Search. 3. You can choose to import works at this point or simply close the window. 4. Go to Account settings to check that you've authorised 'write access'. 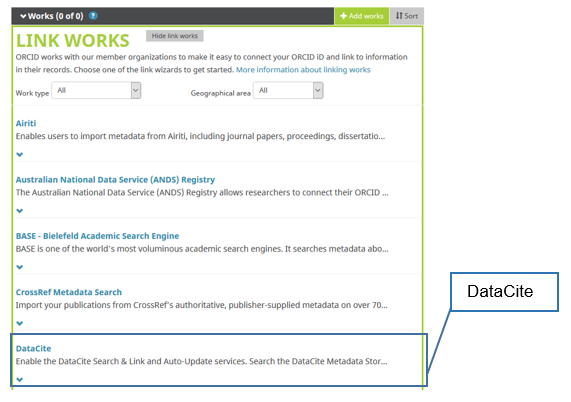 DataCite will now push information to your ORCID record automatically. What does this mean? 1. 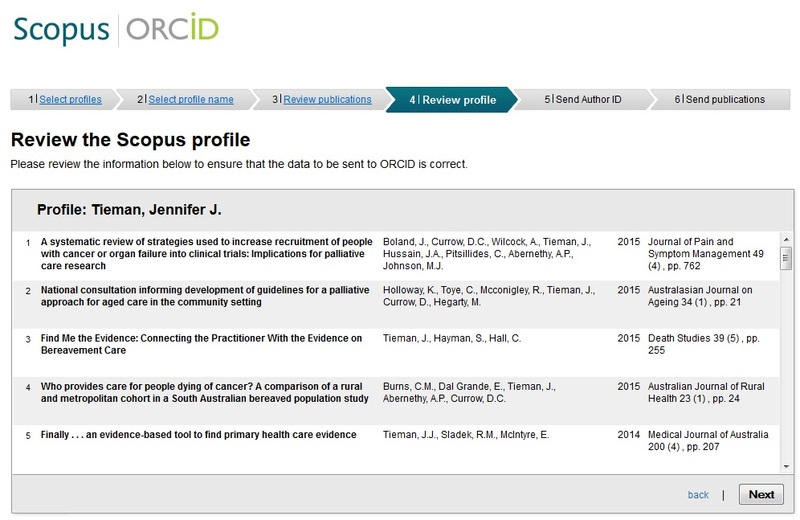 Log in to your ORCID record and navigate to Works, click on + Add works and select Search & link from the dropdown. Scroll down list and select DataCite. 3. You can choose to search & import datasets at this point or simply close the window. 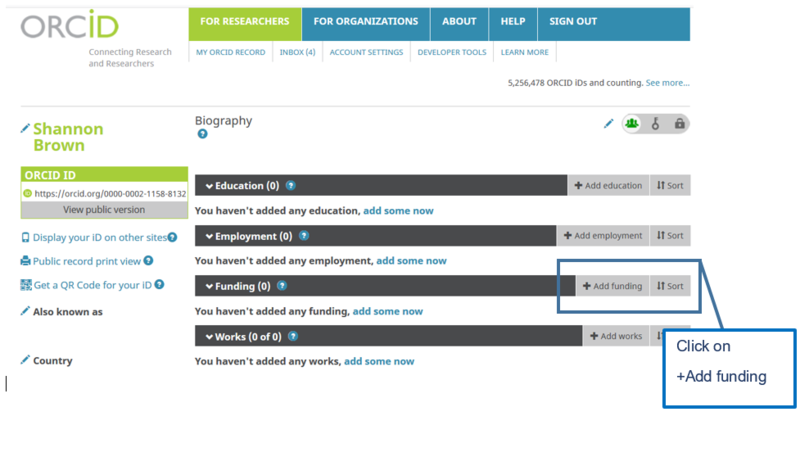 You can use the ÜberResearch search and link tool to populate awarded grants. 4. ÜberResearch will try to find all awarded grants that match your name. 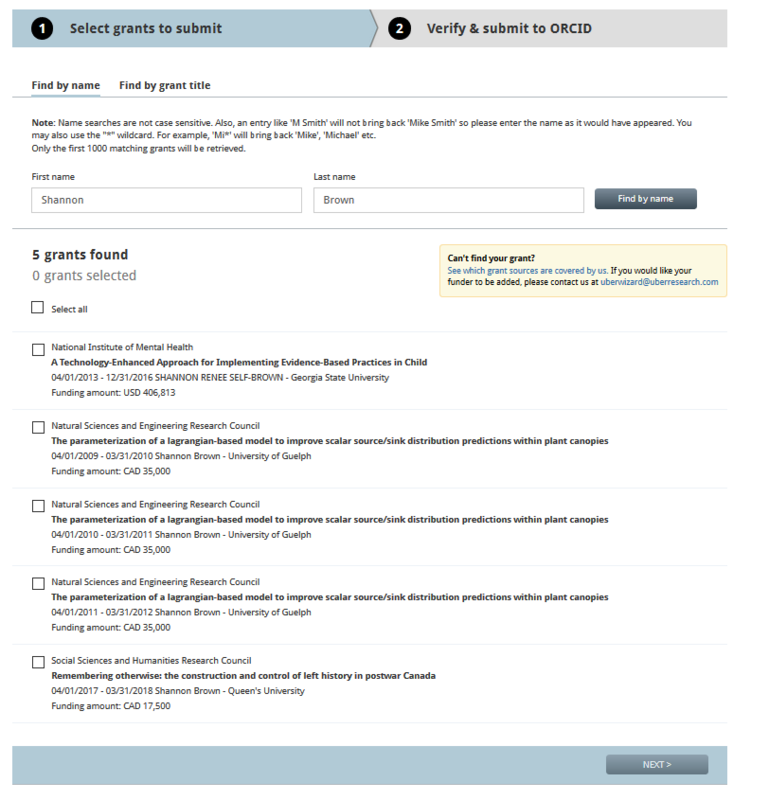 Tick the grants that are yours on the results page and click Next (bottom right of page). 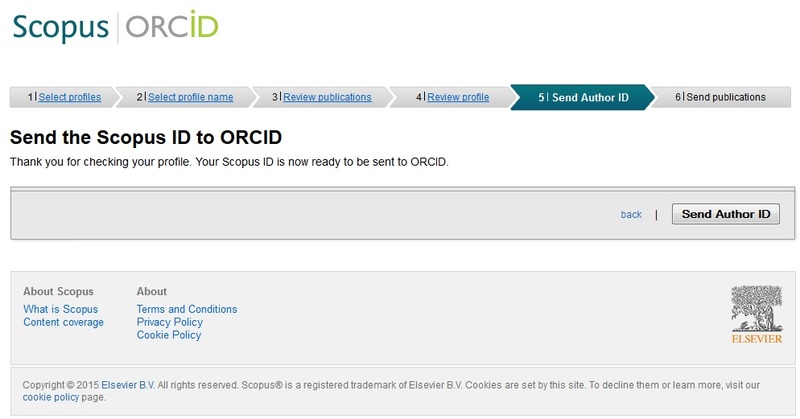 Update your ORCID record by importing profile details and your publication list from Scopus. 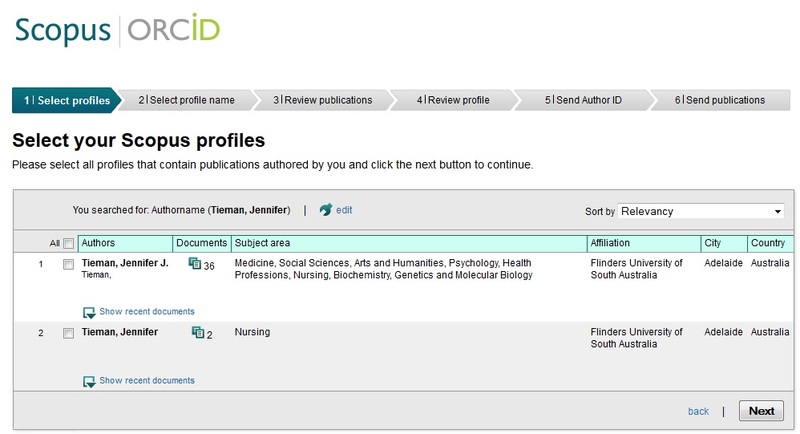 The wizard helps you find your correct author profile in Scopus and confirm the list of publications before it is sent to ORCID. Any changes you make here are also submitted as corrections to Scopus. 1. From + Add works and select Search & link from the dropdown. Select Scopus-Elsevier. 4. Select your preferred profile name. 5. Review your authored publications, unselect those that don't belong to you. 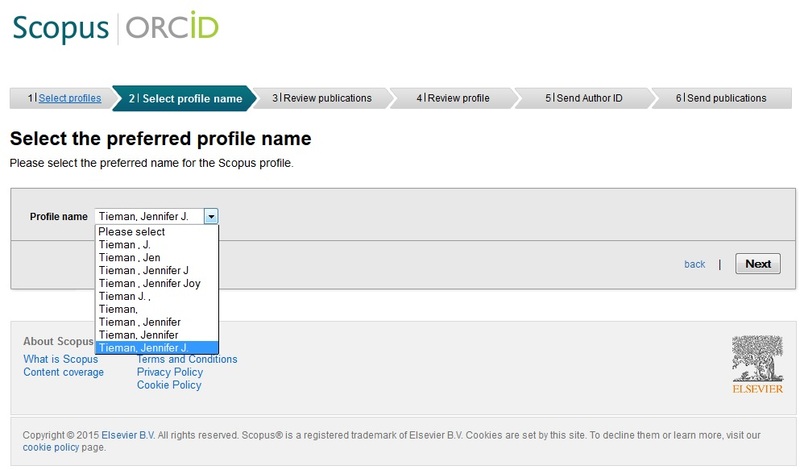 6. Review your Scopus profile, changes made here will update your Scopus profile. 8. 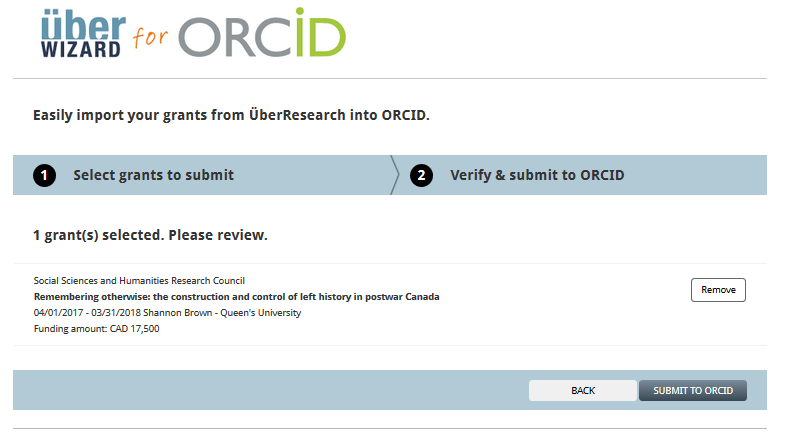 Go back to your ORCID record. 5. 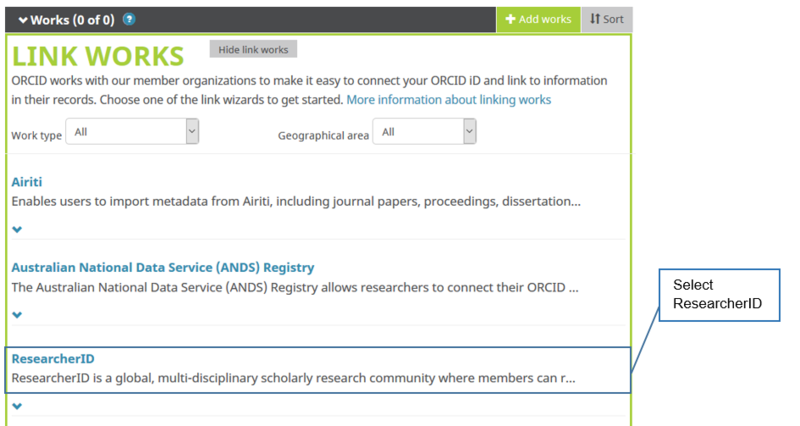 You can select what type of data exchange you want between ORCiD. 7. 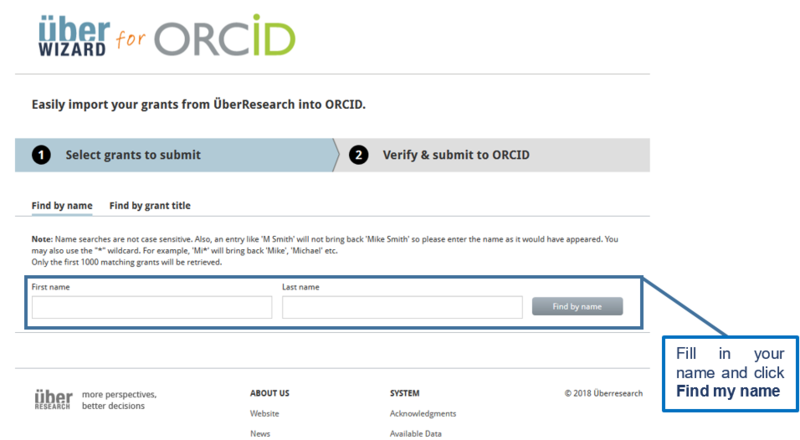 Select the bilateral or unilateral exchange you wish between ReseracherID and ORCiD. 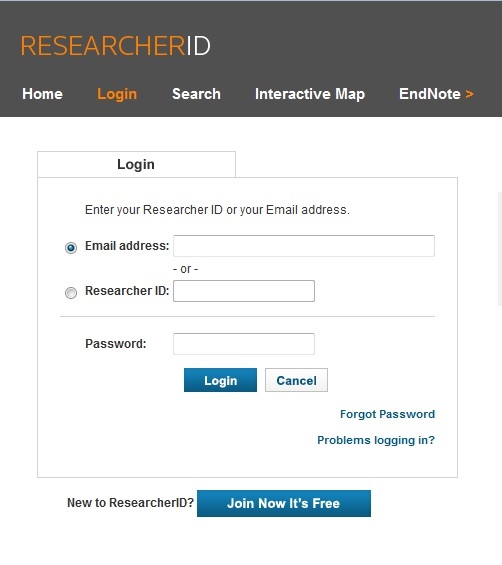 For more detail see the 5 minute Researcher ID (Thomson Reuters) Integration Tutorial. 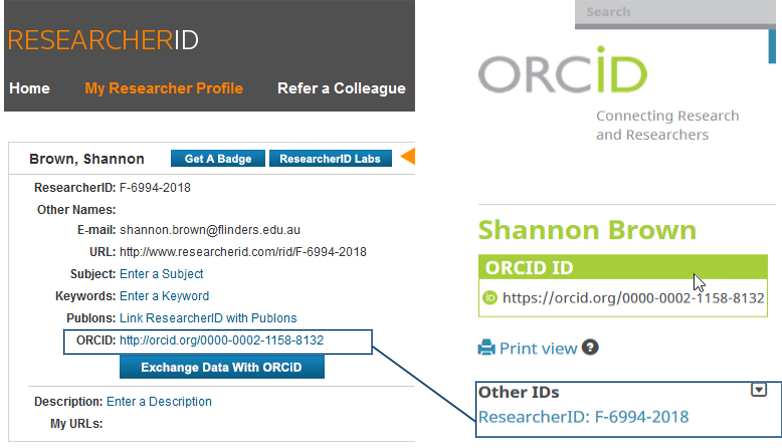 At present there is no way to directly connect your Google Scholar profile with your ORCID iD. 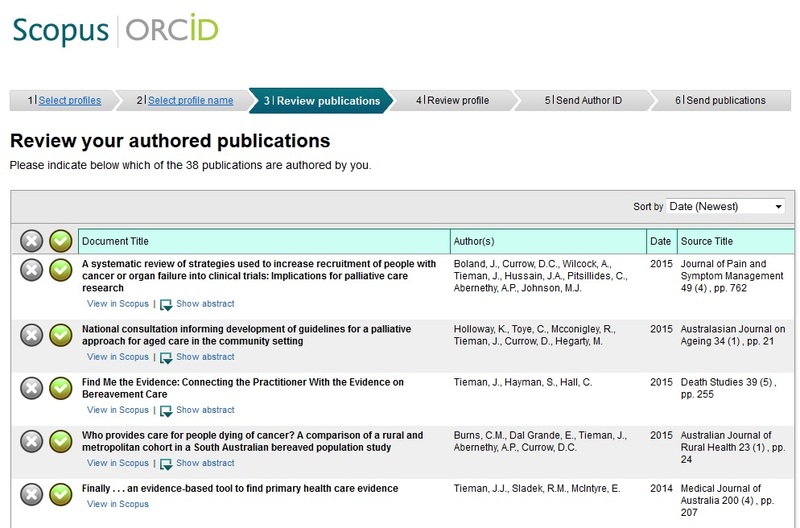 However, it is possible to export your citations from Google Scholar and import them into your ORCID iD. This is particularly useful if you have painstakingly curated your Google Scholar profile for accuracy and completeness. If you have a Google Scholar Citations profile, you can export a list of publications from your profile to a BibTeX file. Note: ORCID does not maintain or provide support for Google Scholar. 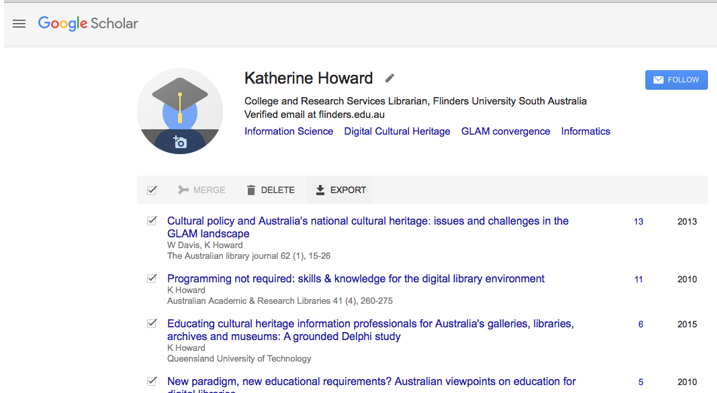 If you have questions about creating, accessing or managing your Google Scholar profile, see Google Scholar Citations help documents or contact Google Scholar. Visit http://scholar.google.com and click and go to My Citations. 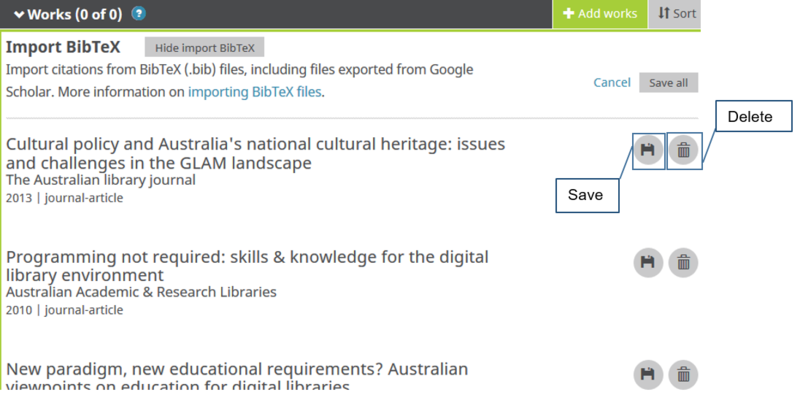 On your My Citations page, select articles to export by clicking the checkbox beside each article. To select all articles in your My Citations list, click the checkbox at the top of the list. Once you have selected the articles you'd like to export, click the Export button, then choose BibTeX. You will be redirected to a new webpage, which will display the articles in a simple text format. In the Save as window choose the destination where you would like to send the file. Note that file name will auto populate to "citations" and you will need to rename it "citations.bib". In Works section of your record go to + Add works then Import BibTeX. Important! 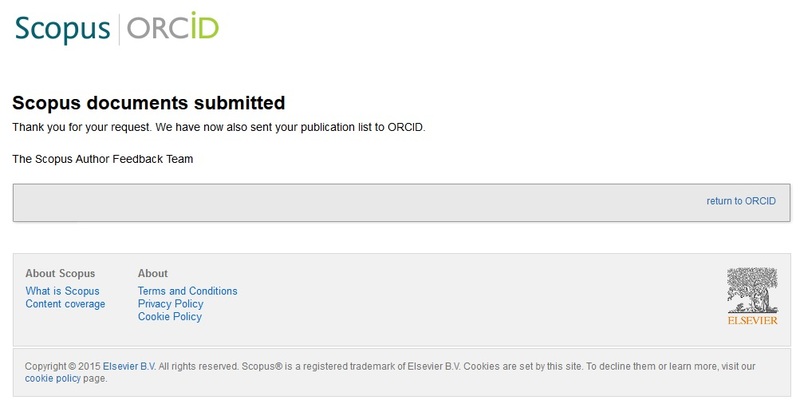 Your import is not complete until you have saved each of the publications that you wish to add to your ORCID record. To Save a citation to your record, click the Save icon. To Delete a citation from the import list, click the Delete (trash can) icon. To Cancel the entire import, click the Cancel button above the list of citations.